I am lying face down on a massage table. My ears are tightly covered, so that I’m deep inside a loud silence of rushing blood and muffled room tones. Explosions of pressure twang against the back of my skull and reverberate through my brain and being, over and over. I feel at first shaken apart, and then, oddly enough, powerfully relaxed — safe. What I’m experiencing is “drumming,” one of the many moves native to tui na, or Chinese massage, the world’s earliest recorded form of massage. The way it’s accomplished is this: Cover the client’s ears tightly with your palms. Press your two middle fingers firmly against the back of the client’s head. Press your index fingers atop your middle fingers, sandwiching your middle fingers tightly. Now let your index fingers slip off the middle fingers, so they snap hard against your client’s skull. Repeat. But why all the drama? Why not just massage or press against the back of the head? “Covering the ears creates the seal, which makes the reverberations — the echo in the head,” explains Justin Polka, 28, who graduated from the East-West Healing Arts Institute in December 2002. A teacher for adults with developmental disabilities, Polka is making a career shift to therapeutic bodywork. At East-West, he gained a solid grounding both in a wide variety of Western styles of massage and in tui na, along with the attendant conceptual framework of TCM. Polka has supplemented his studies by assisting Zhou at his private acupuncture, tui na and herbal medicine practice. Western massage is “more adapted to the pleasurable sensation of things,” says Polka’s classmate Eleni Tsioulos; the Eastern approach “is helping someone develop an active role in their own body.” But she’s glad to learn both styles. “They complement each other. Tui na can get a little intense and potent. You can rely on the Western to bring it back to that calm. But I like the idea of knowing you’ve done something, as opposed to just pleased someone,” she says. Tsioulos, 23, had experience in herbal therapy, but massage was new to her when she began her studies. Tui na — it literally translates to “pushing and grasping” — is central to TCM, the comprehensive approach to healthcare that includes acupuncture, Chinese herbology and meditative exercises like tai chi chuan and qigong. This same body of knowledge underlies reflexology and Asian bodywork modalities like shiatsu and Thai massage. Scholars aren’t sure exactly when Chinese medicine was first developed, but it probably dates back thousands of years before 500 BCE, the approximate date of the Neijing Suwen (a text sometimes translated as The Yellow Emperor’s Classic of Internal Medicine), the first written compilation of what we now call TCM. One of the practices described in the Neijing Suwen is therapeutic massage, then called anmo (literally, “pushing and rubbing”). The term “tui na” came into use during the Ming Dynasty (1368-1644). It’s likely that most practitioners of alternative healing methods in the United States are familiar with at least the rudiments of TCM: An energy called “qi” (often spelled “chi”) animates all life. Health depends on maintaining a balance of yin and yang, the complementary energies within qi. 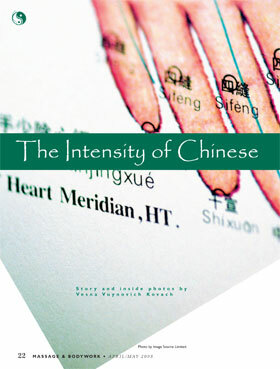 Qi courses through the human body along energy highways known as channels or meridians. By stimulating precise points along these meridians, other parts of the body that lie along the same meridians can be influenced, even though they might seem unrelated. That’s how an acupuncturist can ease a stomachache by inserting a needle into certain points on a patient’s hand, foot or leg. Once not well respected, these Eastern ideas — or at least the results of their practice — are increasingly becoming accepted by mainstream Western medicine. In 1998, no less an authority than the National Institutes of Health pronounced acupuncture “an effective treatment” for a variety of conditions, clinically proven to relieve aches and pains and to control nausea resulting from chemotherapy. The NIH hasn’t weighed in on TCM as a whole, but tui na is based on the same TCM principles as acupuncture. Learning to view the human body according to the TCM paradigm was a challenge for Anne Stephenson, a licensed practical nurse of 22 years. “The Eastern way is a lot more abstract,” she says. “Parts of it were hard to comprehend, because it’s so against Western logic.” Stephenson had quit her job, finding herself drawn to “the Eastern way of things” and seeking a way to recast her life. She discovered massage after a combination of acupuncture and tui na treatments healed her chronically aching neck. “This massage had the Eastern approach and the touch therapy I wanted,” she says. While Swedish-based Western massage forms are founded on an understanding of musculature, tui na follows from an understanding of the energy meridians. As a result, some of the key body areas in tui na are left more or less untouched in Western massage. For instance, TCM identifies dozens of individual points on the head, each with its own potential for healing. But in Western massage — as in Western medicine — these points don’t have any particular importance. Then he climbs right up onto the massage table and grasps the parallel steel bars of a 6-foot-high frame around it. The frame is there specifically for the safe practice of walking massage: chai qiao. Next, one foot, wedged in my armpit, pulls in the opposite direction from the foot on the back of my wrist. It’s not what I’d call restful, but for my ever-tense shoulders and upper back, somehow it feels marvelous. I hear, “Ow!” It comes from me. Within the vast scope of TCM, tui na is a extensive, complex system in its own right. Tui na techniques include pushing, dragging, “nipping,” strong pinching, chopping, rubbing, and kneading, to name just a few. There’s vigorous rolling using the knuckles and the back of the hand, “scrubbing” with the pinky finger side of the hand, applying pressure with the elbows, grasping at the back and spine with splayed fingers and interlocked thumbs, and brisk tapping with the cupped hands or edges of the palms. Deciding when to use any of these moves depends on a variety of factors. A tui na practitioner well versed in TCM theory can address the complete range of human pathology. For Western bodyworkers schooled in anatomy and musculature, TCM “just adds another dimension,” he says. “And it doesn’t contradict anything they’ve learned before.” Helm is dean of allied studies at the Pacific College of Oriental Medicine and director of the Taoist Sanctuary, both in San Diego. The same integrative approach is taken towards combining Western medicine and TCM in China, where it’s standard for a mix of TCM, TCM-and-Western and Western doctors to practice in concert. The 43-year-old Zhou is a combination doctor; his dual medical degree from Heilongjiang Medical University of Traditional Chinese Medicine fully licenses him (in China) to practice both Western medicine and TCM. “Tui na offers an alternative to acupuncture — a therapy for aches and pains without any needles,” Zhou says. And there are still plenty of people who are scared of TCM — the needles, the alienness of it all, David Milbradt says. Milbradt operates a private acupuncture and herbal medicine practice in Madison and he is a member of the faculty at East-West, where he teaches a course in the fundamentals of Oriental medicine. Some people might never dream of visiting a doctor of Chinese medicine, he says, but they just might visit a massage therapist to relieve some of their pain or to restore their feeling of well-being. If that massage therapist is armed with tui na, so much the better. “For some people, massage is more familiar,” he explains. “It’s a step they can imagine. Oriental massage opens up the chance to work with more therapeutic possibilities than relaxation.” Another plus: massage involves “less liability” than acupuncture. It also takes less time and money to get an education and become licensed, and the practice itself is far less expensive to set up. Milbradt tells me that some of East-West’s latest crop of students, inspired by the TCM theory they’ve learned here, have applied to acupuncture school. But for most, their East-West education provided exactly what they were looking for: a way to synthesize Eastern and Western approaches into their practice of massage. education his school — or any tui na curriculum in the United States today — offers. A 751-hour program like East-West’s can’t impart as much theory as a full-time TCM institution in China that includes ongoing tui na instruction as part of its five-year program. The knowledge East-West gives its students is “more basic, like a Chinese medicine technician’s skill,” he explains. Still, East-West is one of the institutions that can qualify students to apply for certification as an Asian bodywork therapist with the National Certification Commission for Acupuncture and Oriental Medicine (NCCAOM). The NCCAOM is the organization that grants national certification in acupuncture and Chinese herbology; their new Diplomate in Asian Bodywork Therapy was added in 2002. The Pacific College of Oriental Medicine is another school whose tui na grads qualify to take the exam that allows them to place the letters “Dipl. A.B.T. (NCCAOM)” after their names. Both Zhou and Helm are certified instructors with the American Organization of Bodywork Therapies of Asia (AOBTA), and both offer students the tools for a lifetime of tui na practice. But both also welcome massage novices and seasoned professionals who simply want to add some tui na to their practice — a little or a lot. How does tui na fit in with the larger picture of bodywork in America today? “The way that it fits in is that people go and study the whole system,” she says. “I’ve been teaching for more than 20 years,” Helm says. “I’m dealing with the reality of how it’s used. You have some people who want to develop a TCM approach, closer to the acupuncture model. And a lot of students who are not interested in being primarily tui na. They’re interested in specific therapeutic applications. A person is having problems with their shoulder, so you should do this. Swedish massage doesn’t address that specifically. They break into tui na for 15 minutes, resolve the shoulder problem, and then go back to the Swedish massage. In the past few years, Helm has seen tui na enrollment swell. “As bodywork in general matures more in this country, tui na practice and teaching will expand,” Helm predicts. In recognizing the range and power of the ancient science of tui na, Americans are beginning to experience what’s been known in China for millennia: massage can be seriously therapeutic, not simply relaxing.